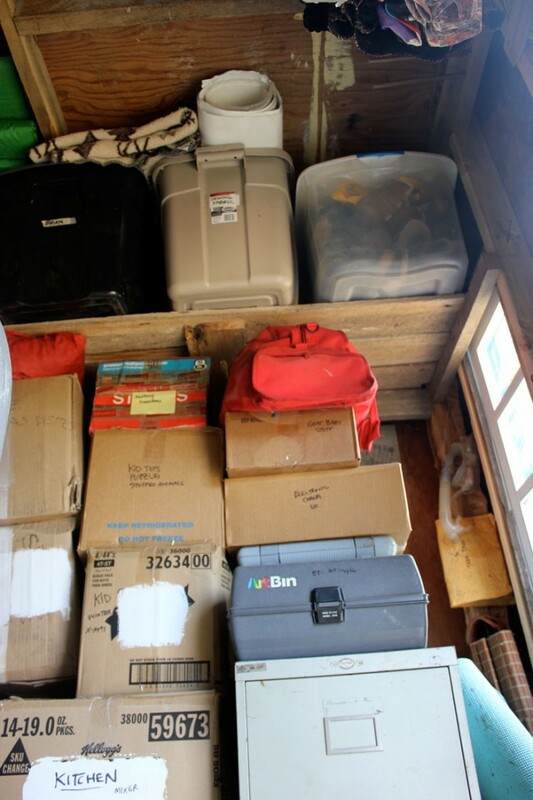 This spring we needed to move all of our belongings out of a 24×36 storage shed and onto our land. While this was great motivation to get everything we owned in one place, it was also a bit daunting, as we had not a square foot of storage space! 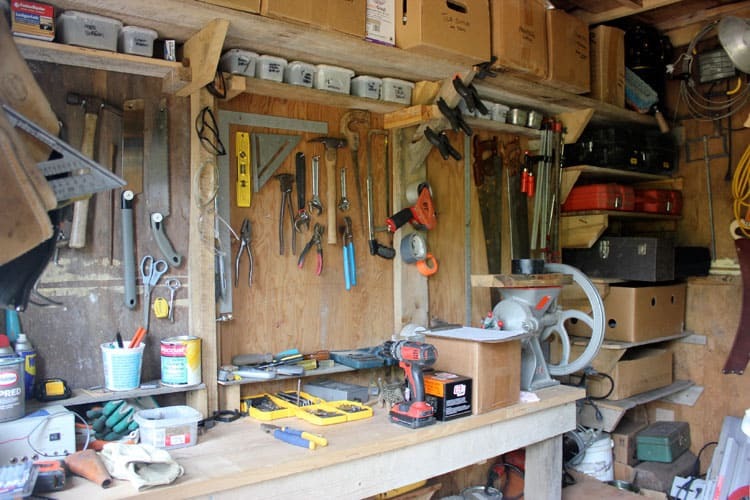 Brian quickly began work on a 100 square foot tool/storage shed. 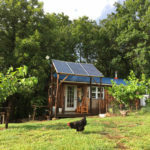 The construction of the shed itself is really interesting – he hand-hewed off-cut black walnut limbs into square posts that created the shed’s support. We purchased some newly milled local lumber from the Amish and a new metal roof that is used to collect 200 gallons of rainwater. 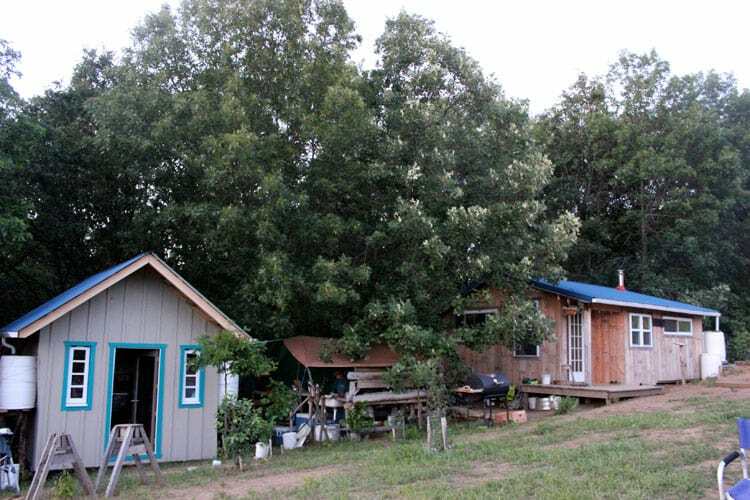 The floor, loft and siding were constructed with reclaimed plywood that was literally lying on the side of the road, waiting to be dumped. Brian offered the former owner $30 for the entire pile. With a little faux board and batten effect and a coat of fresh paint (“Olivewood”), the shed is cute and super-functional. The shed, outdoor kitchen, and our house! 50 gallon barrels collect rainwater. The barrels on the left flow directly to a spigot in the garden! 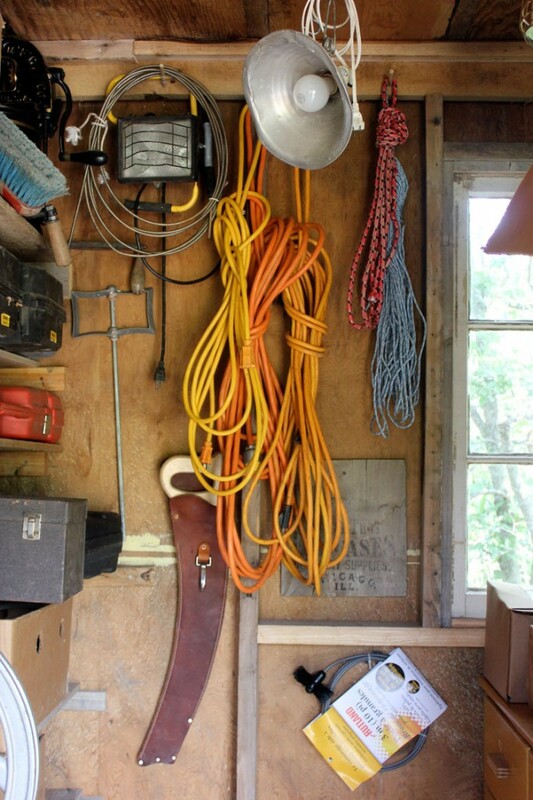 A well-organized tool shed is a thing of beauty! A tall ceiling and a loft space make great use of an otherwise tiny (10 x 10ft) space! And above the door is my closet! 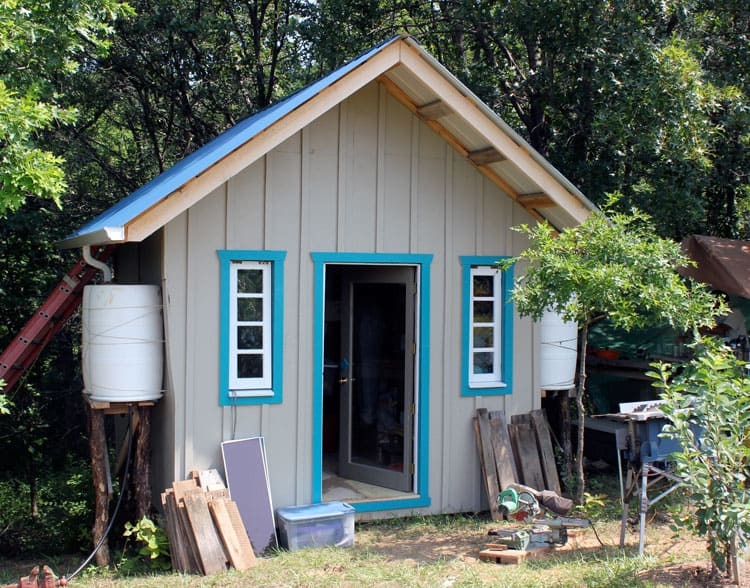 Do you have a homestead shed? What do you keep in it? Enjoyed viewing the shed pictures even though I had seen it “live” just recently. One thing that struck me was something I missed recognizing when we were there. It’s the way you label recycled cardboard boxes using a patch of white paint on the box as a background for writing with felt-tip pen! After all my years of trying to find a blank areas on cardboard boxes which usually contain lots of words and images (used for the original purpose of the container) and ending up with hard to see labels anyway…….. Even tape peels off eventually. Thanks. 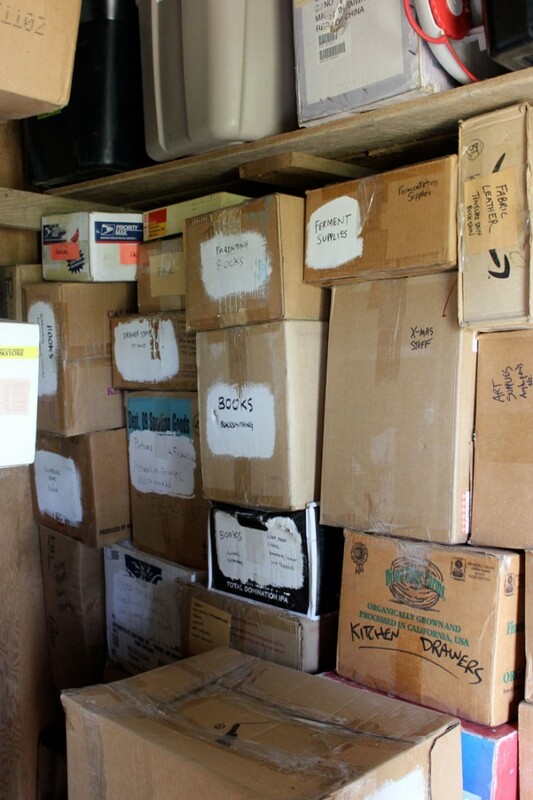 Oh yes, that was Brian’s genius, of course, but it’s been a really effective way of being able to spot what’s in the boxes quickly and easily. And when contents change, you just paint over it! 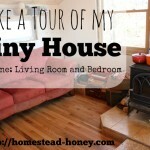 My husband built a homestead shed recently too! 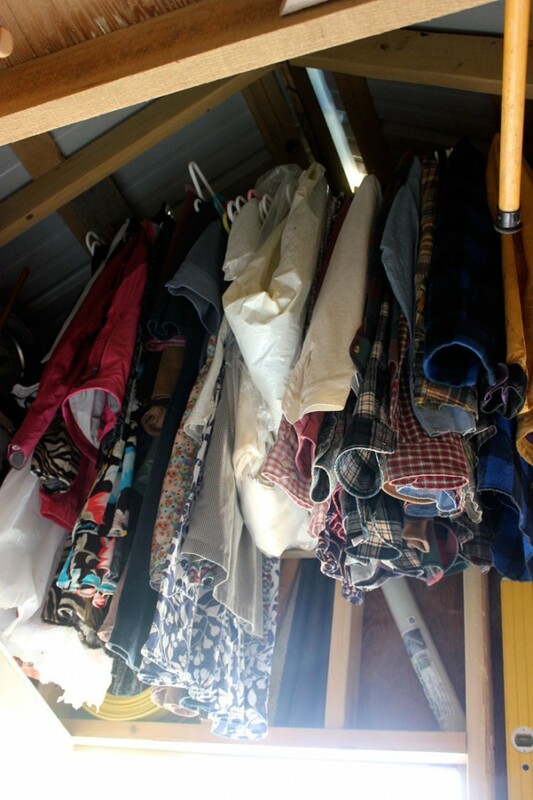 A loft space is a great space for things that are rarely needed. We had to completely empty our basement, so he could gut and redo everything to expand our living space. All six of us are currently living in 2 bedrooms, so more bedrooms will certainly be welcome! That’s a lot of people sharing two bedrooms! 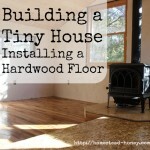 I hope your renovation progresses smoothly so you can enjoy your new space! Nice job, great looking shed! It’s amazing how much benefit some good storage space adds to daily life. I like that you elevated the rain barrels a lot. I bet that really helps with the flow to the garden. Thanks for sharing all the pix. Thanks Lon! Yes, the rain barrels are just high enough to give low pressure flow to the garden. It sure beats hand carrying buckets!